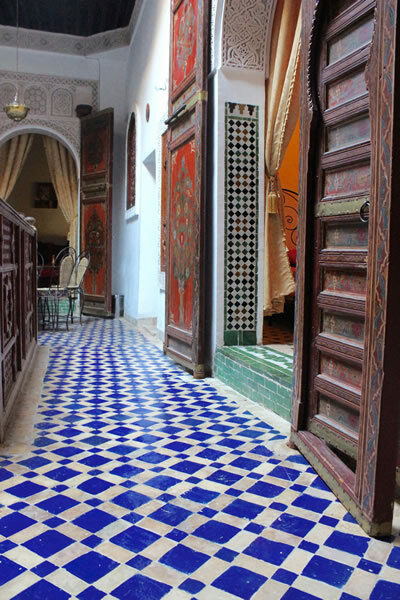 Fes has the oldest medina in the world. The medina is about 800 years old. Fes is the second city we visited in our tour of Morocco in December 2014. 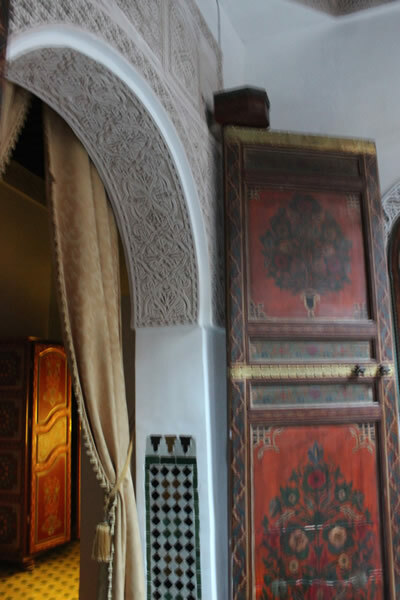 We landed in Casablanca and traveled to Fes after a couple days jet lag recuperation. From Casablanca we took the train to Fes. By that train trip we were acclimated to the alien world in which we found ourselves. Being surrounded by Arab culture, Muslim culture, the food of the region, French language, the Casbah, Africa and the Berbers was somewhat of a shock in total. Casablanca is more cosmopolitan whereas Fes is much more Morocco and Berber. Fes is in the middle Atlas mountains. In winter they occasionally get snow. 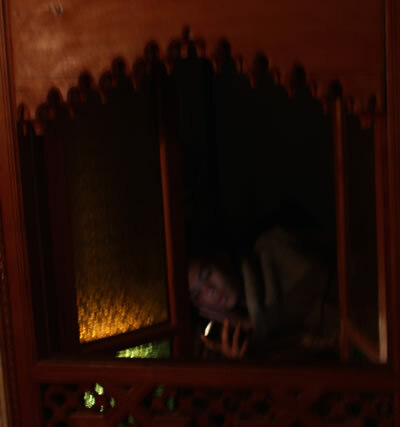 We arrived at the beautiful riad shown in the pictures below after a 4 hour train trip. We almost missed the train because they changed tracks at the last minute and we only learned of it because of another tourist who let us know. 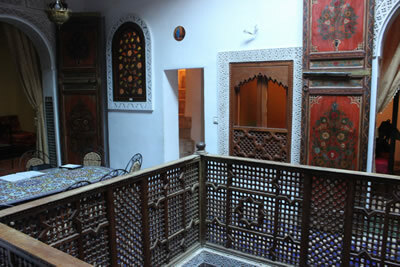 A riad is a large multi-story house with a rooftop terrace. 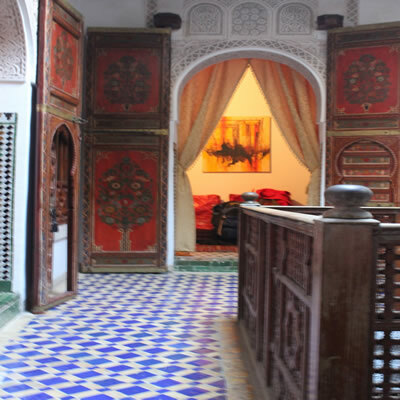 The inside of the riads we visited were gorgeous. The one we stayed in cost $50 a night for the 3 of us. We each had our own rooms with a private bath. We had the run of the place. All of our rooms were on the second of 3 floors. The place could have slept about 20 people. The terrace was gorgeous exposed to the evening air and a wide view of the medina and mosques. We were still getting used to the various calls to worship each day and the racket that entailed. There was lots of restoration going on in the areas of the medina we visited. The red door you see on the left has a smaller door cut out of it. The main door is rectangular on an arched doorway. The height of the door is probably 9 or 10 feet. The inner small door is less than 6 feet and barely wide enough for me to enter easily. The view above is of the atrium. Above this floor is the terrace and the window allowing light into the building. Around the edge of the atrum are 3 bedrooms. In the middle is the beautiful carved balcony. On the fourth wall where there is no bedroom is a small fountain. At one side of the balcony is the dining room table where we were served our breakfast and dinner. Each bedroom had a step leading to the inside for some reason. 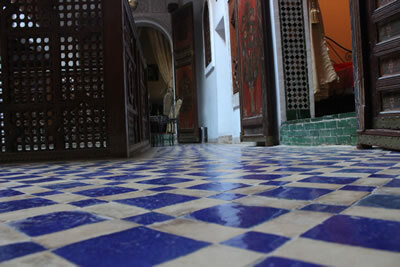 There were oddly placed steps throughout Morocco - in riads, alleys, pathways, stores, restaurants, etc. The stairways themselves were each unique. Some apartment buildings had beautiful perfect staircases except for that top or bottom step which would throw you off balance. This is the view down the atrium at the bottom floor where the kitchen was. 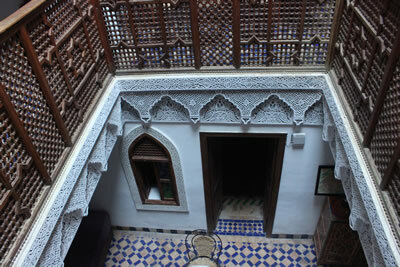 The riad was like a museum of art with fine quality carving and lots of space. The building was not tightly sealed with open air windows here and there. Each riad shared a wall with the next building. There was also no openings in the front or rear from what I recall. The only natural light was from above. That little sliver of a door is the stairway. The stairs tilted left or right, forward or backward, some steps were taller, some had more or less depth. With my backpack on I was scraping the ceiling when I brought my bag up. It was almost not wide enough either.